NEMO Fillo Elite Luxury Pillow. 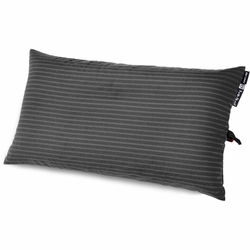 The Fillo™ Elite Luxury backpacking pillow is the ultralight version of our award-winning Fillo™. At a fraction of the weight (less than 4 oz) and packed size, it still offers impressive height and cushion despite its ethereal weight. We decided to bring clever design and luxurious attention to an often-overlooked piece of gear: the humble backpacking pillow, which is essential to a comfortable night’s sleep. We designed the Fillo™ Elite Luxury with a layer of Primaloft® insulation, combined with a 3” baffled air cell and a soft cotton jersey cover. The result is a pillow that is soft and cradles your head nicely, yet packs down as small as a kaffir lime.